been revealed as part of the Southbank by Beulah competition. 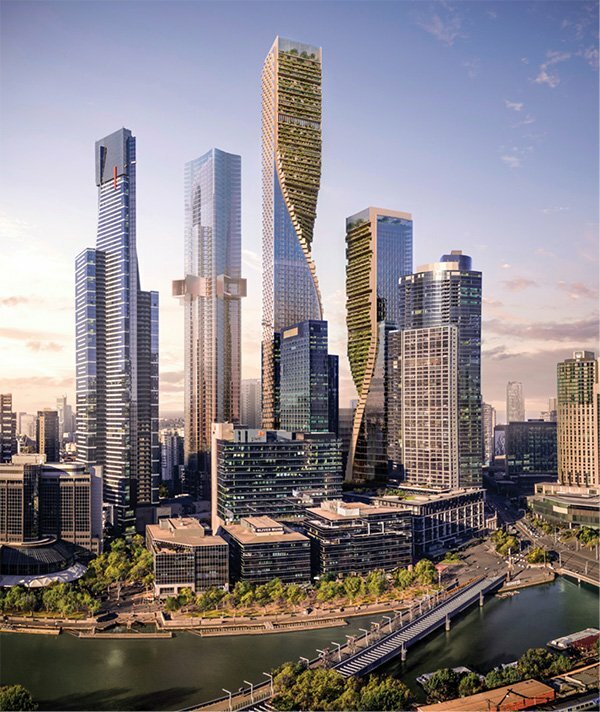 From twisting towers, interlocking blocks, a propeller penthouse, stacked neighbourhoods, vertical cities and an illuminated cloud, the winning concept is expected to draw global attention with all six designs imbuing extraordinary innovation. of the area as Melburnians currently know it. Melbourne property specialists Beulah International purchased the prominent 6,061sqm BMW Southbank site late last year in a deal valued at more than$100 million. Beulah’s vision for the site is to create a state-of-the- art, integrated mixed-use environment that would include retail, hotel, residential, commercial, cultural and public spaces. The site will be centred around innovation in architecture and design, public amenity and technology and could potentially be Victoria’s largest single phase project. “Our overarching vision is to turn the BMW site into a landmark lifestyle destination that will be recognised around the world and that contributes to the surrounding community by lifting the urban fabric to a new level,” said Adelene Teh, Beulah International Executive Director. “We’re also looking for a design team that puts public amenity at the forefront of their approach, as engaging with the community and integrating with the urban context is an important driver for us as a developer,” she said. The six teams to submit their design concepts as part of the six month long competition include, Bjarke Ingels Group with Fender Katsalidis Architects, Coop Himmelb(l)au with Architectus, MAD Architects with Elenberg Fraser, MVRDV with Woods Bagot, Office for Metropolitan Architecture (OMA) with Conrad Gargett, and UNStudio with Cox Architecture. The designs were revealed at a public symposium on Friday July 27 th that was attended by state Treasurer Tim Pallas, as well a large crowd of property, architecture, urban design, finance, real estate, government and public attendees. Speakers who presented their team’s design included Brian Yang Partner of Bjarke Ingels Group, Wolf. D Prix co-founder of Coop Himmelb(l)au, Ma Yansong founder of MAD Architects, Winy Maas co-founder of MVRDV, David Gianotten Managing Partner-Architect of OMA and Caroline Bos co-founder of UNStudio. The decision makers for the winning design comprise of seven highly regarded individuals, including Jill Garner, Victorian Government Architect and Jury Chair, renowned architectural photographer John Gollings , Prof Thomas Kvan, former Pro Vice-Chancellor at the University of Melbourne and Director of Australian Urban Research Information Network, Cameron Bruhn, the Editorial Director of Architecture Media along with Adelene Teh and Jiaheng Chan from Beulah International. The winning design will be announced in August. The six shortlisted designs can be found in the accompanying document. All designs will be on public display until August 10 at the Beulah Pavilion, a commissioned pop-up structure in front of the Southbank red steps. Urban Tree will feature small, green foothills that lead pedestrians up to the ‘mountain village’, with amenities along Southbank Boulevard including a children’s playground, public artwork and a water feature. With 43 dedicated residential floors and 24 floors of hotel, the most unique feature of Urban Tree is The Cloud, situated 317m high in the sky. 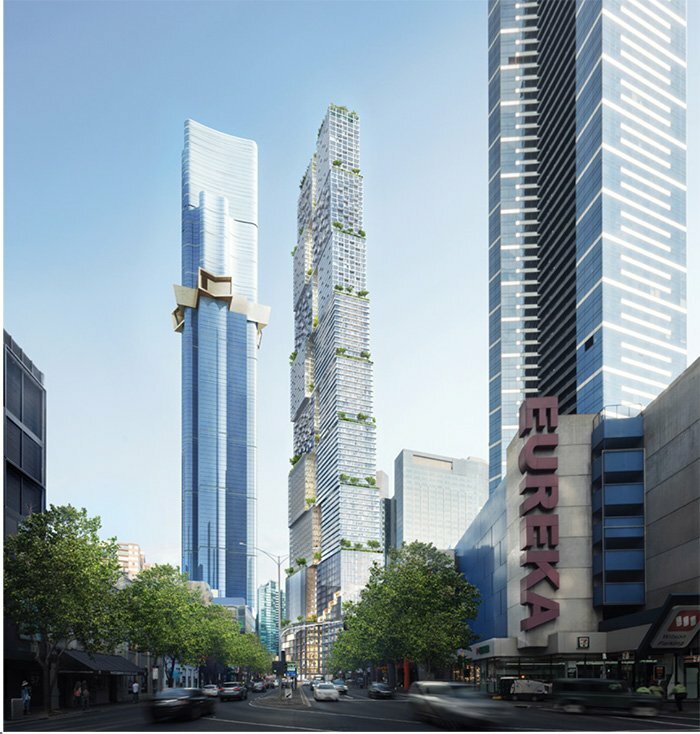 Offering 360 degree views of Melbourne, The Cloud will house the hotel’s public amenities and will change appearance as the day transitions to night, with LED lighting creating an illuminated spectacle. Reaching 360m high, Urban Tree will include a 1,200 person capacity auditorium space, an 800 person capacity tiered seating concert hall, a library, cinema, food hall, organic supermarket, commercial office space and a childcare facility with outdoor terraces. 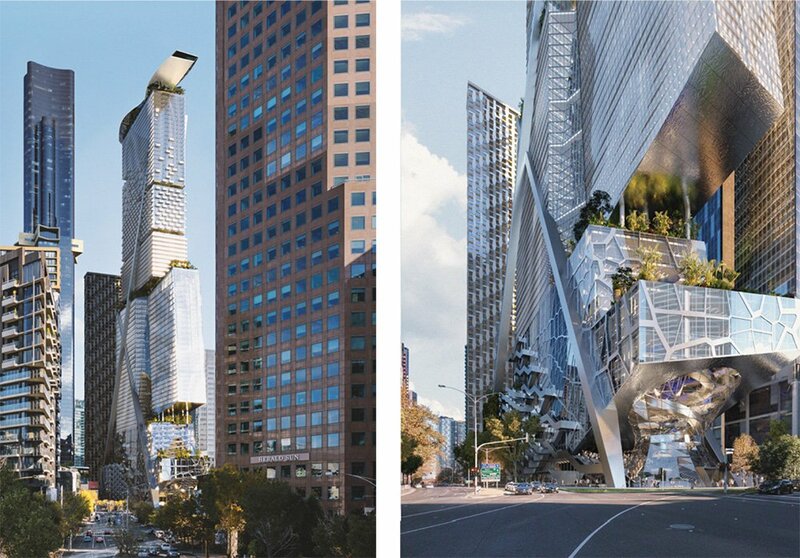 Green Spine will comprise of two towers both with twisting geometry of glass façade and terracing. Conceived as a conceptual extension of the Southbank Boulevard, the Green Spine will provide a pedestrian connection at street level through a series of stairs and stepped terraces, leading visitors up along the retail and entertainment precinct to The Garden. 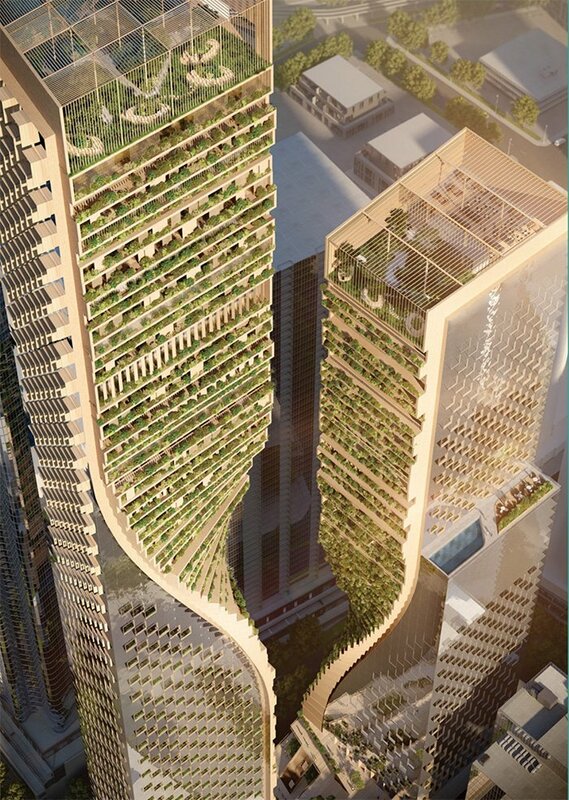 From thereon, the spine twists into a series of outdoor spaces and green devices along the façades of the two towers, culminating at the top of the residential tower as the Future Garden. 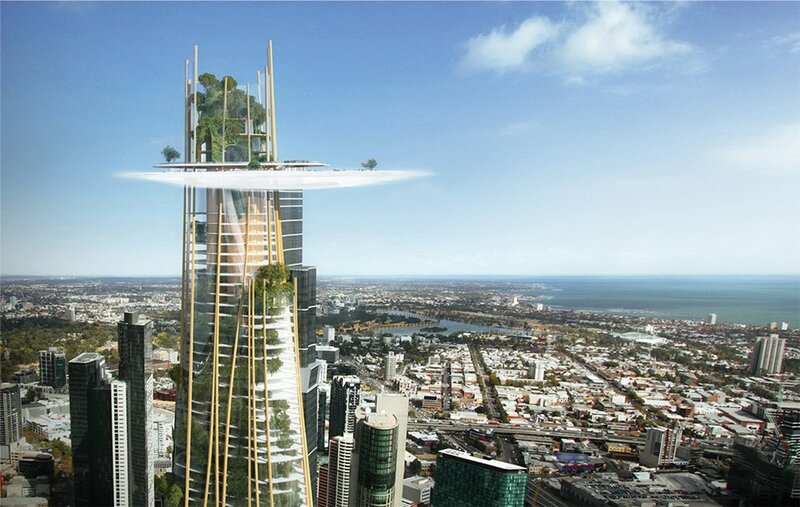 The residential tower will reach 356.20m high, crowned by the Future Botanic Garden, a publicly accessible garden in the sky. The hotel and office tower will reach 252.20m high. Green Spine will include residential, office, hotel, entertainment facility, BMW Experience Centre, Childcare Facility, School, Retail and Food Precinct complete with a food hall, cinema, library and interactive spaces. The Lanescraper is two blocks that extend upwards and interlock to provide connectivity and structural rigidity. In the spaces between, a series of laneways from bottom to top are proposed, each one with a unique identity and experience. The Lanescraper is proposing a two-tiered concentric auditorium that will seat in excess of 3,000 patrons and a BMW experience centre that occupies four levels, connected by a central void and car lift around which a spiral stair meets all levels. Reaching 359.6m tall, The Lanescaper will include retail and culture amenities, including a library and both informal food areas and formal restaurants, as well as office, hotel and serviced apartments and residential. Stack is a new kind of skyscraper with stacked neighbourhoods connected from the bottom to the top and vice versa by lifts, stairs and escalators to create an interconnected vertical city. Each bar within the stack has its own appearance in pattern texture and shade, reflecting the building barcode of functions. This ranges from openable façades at the park levels and transparent façades in the public retail facilities, with a tree-like structure representing the park and a beehive structure marking the residential part. 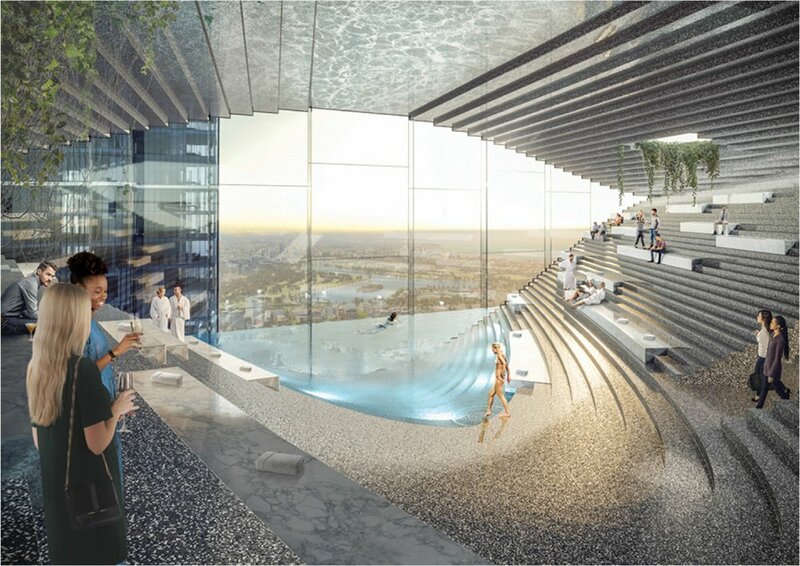 Reaching 359m high, Stack features a hotel pool in the centre of the building, complete with an underwater city window, surrounded by an amphitheatre of terraces and stairs. 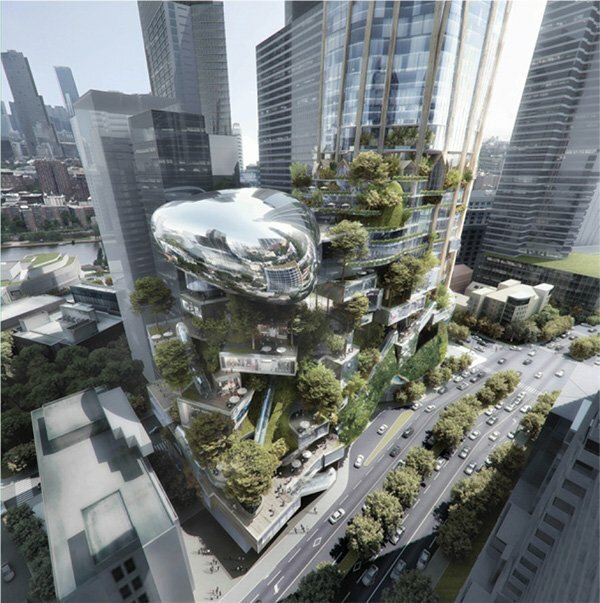 On top of the hotel is The Tropical Garden; a rainforest garden high above the city and within the forest understory, a childcare centre is created. Paths and recreation spaces enable a variety of activities typically impossible in high-rise structure, including being able to walk your dog, or go for a jog. A suspended ‘forest track’ open stair offers a sublime climb through the treetops and surrounding skyscraper rooftops. By emphasising the base of the building instead of its crown, this concept proposes a ground floor market that draws inspiration and references the historic Melburnian arcades and vaulted markets. The base of the proposed design is a 24/7 mixed-use vertical city in which many cultural, commercial, educational and social elements are bound by retail, food and beverage. In this vertical city, there are highways of movement through the large express escalators, shortcuts by elevators, and laneways to wander on through the normal escalators, stairs, and voids. Situated above the vertical city are commercial office spaces, hotel and residences, with supporting amenities at the top of the tower. The residential part of the tower is situated at the top to capitalise on views and daylight.